Honeyvine milkweed (Ampelamus albidus or Cynanchum laeve) is a native, perennial vine that spreads by seed and long spreading roots. The stems are slender, smooth, twining, and without the characteristic milky sap that is typically present with other milkweed species. The leaves are dark green, smooth and large, growing up to 6 inches long. 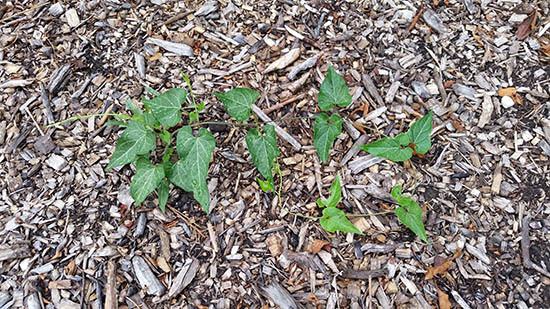 They are heart-shaped on long petioles and opposite on the stem, which helps to distinguish this species from similar looking weedy vines such as bindweeds. Flowers appear mid-summer and are long lasting. Flowers are small, whitish or pinkish, sweetly fragrant, and borne in clusters – very different in appearance than the funnel shaped flowers of bindweed and morningglory vines. The flowers will develop into a 3 to 6 inch long, smooth, green seed pod that is similar to that of common milkweed. Once dry, it will split along the side and release seeds, each carried in the wind by a large tuft of white hairs. Pods persist into winter and can then be spotted easily in the landscape when evergreens are the backdrop. 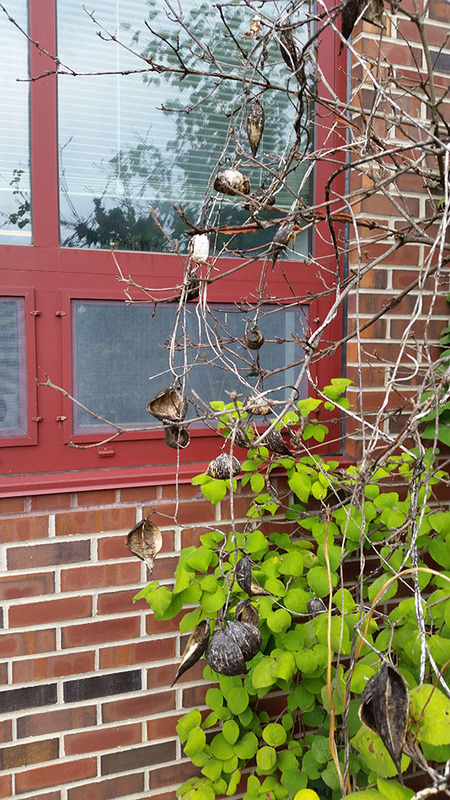 The presence of the pod hanging from a vine is a dead giveaway for identifying this weed. 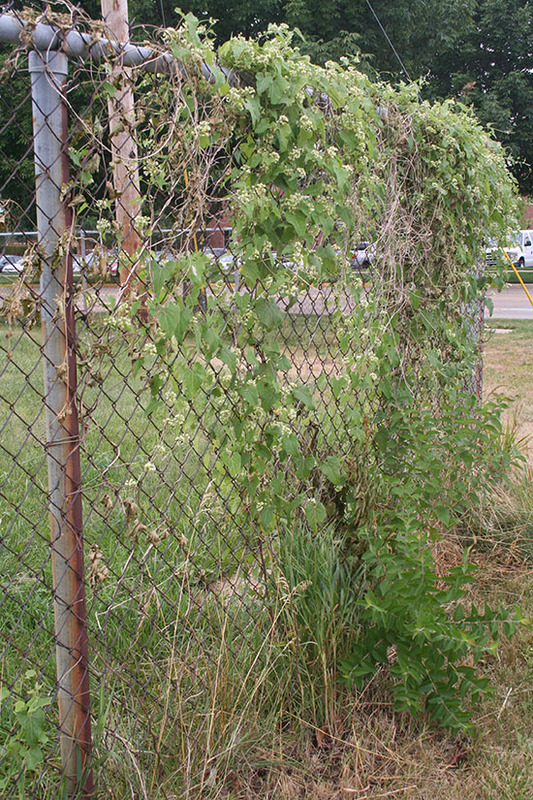 This weed can be a problem in tree plantings since it can twine around the plants. It prefers moist, fertile soil and full sun but can grow in a variety of conditions. It is often found in fencerows and disturbed sites. Other names for this plant include Bluevine and Sandvine. Honeyvine milkweed flowers smell intoxicatingly sweet. I have always thought of this plant as a weed. Recently I spent some time pulling new shoots from a bed for about the third time this summer. It is aggressive and persistent and I know it will be back. Unfortunately, herbicides are not an option for this particular site. Repeated hand removal can eventually eliminate it. I have learned, however, that to many this plant is desirable as it serves as a food source for the Monarch butterfly. Butterfly gardening is quite popular now with the decline of the Monarch population. I came across one-pint plants available for sale on eBay. Had I have known this plant was so desirable I would have been carefully potting up those new shoots. Upon telling my husband about my findings and actions, he replied with, "and that's why we're not rich." Funny guy.